Proclaiming the Word of God is an important ministry performed during Mass on weekends. The role of the Lector is one of commitment for this significant part of the Mass. You are assigned to scheduled Mass(es) based upon your selection. St. Alban Roe’s Music is rooted in prayer and scripture, while working consistently to encourage and enhance congregational participation during celebration of the Mass. 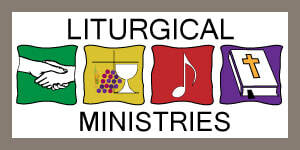 Our ministry offers opportunities for almost any age and musical talent. Open to adults and high school students who enjoy singing and fellowship! Rehearsals are at 7:15 pm on Wednesday evenings in church. This choir sings at the 9:30 am Sunday Mass, the Midnight Mass on Christmas Eve, and is an integral part of the Easter Triduum celebration each spring. **Cantor: A leadership role that is open to members of the St. Alban Roe Choir. Open to singers in 3-8 grades. This choir sings once a month during the school year at the 11:30 am Sunday Mass, in addition to Christmas Eve. Rehearsals are Wednesday afternoon of the week that the choir will sing at Sunday Mass. This choir sings for funeral Masses. Members will receive a phone call when a Mass is scheduled. Open to ages 10 to 100! Rehearsals are on Thursday evenings at 6:30 pm. This choir plays one or more times a month at different Masses, dependent upon scheduling and other events. Welcome worshippers at Mass, collect and present offerings of God’s people, promote comfort and good order in church. Ushers approach and invite a family at each Mass to be the Gift Bearers in our Eucharistic celebration. Men and women volunteers tidy the church (no heavy cleaning) after the 8:30 am Mass on Thursdays. Purificators (small altar linens) are washed and ironed by volunteers at home. Boys and girls in fifth grade through high school are needed to assist the priests in serving the Mass. Please complete the form and return it to Sr. Christian. Sunday: 7:30, 9:30 & 11:30 a.m.